bottom line savings by using digitally enabled equipment and machinery to implement more efficient and effective processes. So, what’s behind Serving the “Segment of One”? Providing solutions that precisely fit the needs of one single customer has been commonplace in traditional engineer-to-order environments. Now, the ability to capture customer requirements effectively and drive mass customization are critical to giving customers exactly what they want. To provide precisely what someone requires, intimately engaging with them and understanding their needs become increasingly important. A good example is MAN Diesel and Turbo, a producer of turbochargers and large diesel and gas engines for maritime and stationary applications. They have increased the transparency of information on every customer and have used this enhanced visibility to offer tailored products and services to each customer. To achieve this level of transparency, they have replaced multiple customer relationship management systems spread across subsidiaries with one common solution, where all information on each individual customer is stored and managed, thus accelerating sales processes, compressing lead times, and differentiating themselves from the competition in a fast-paced, global market. MAN Diesel and Turbo is also using product configuration capabilities that enable them to create the individual product based on the customer’s specific needs. This configuration is then seamlessly handed over to manufacturing for execution of the individual, highly-customized production order. 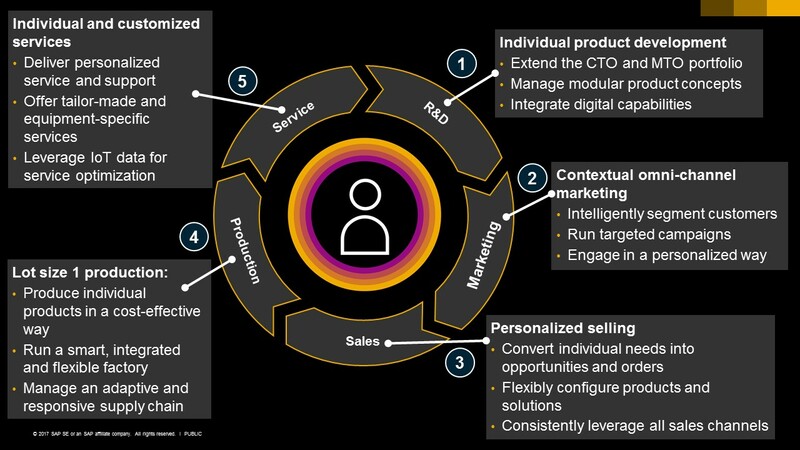 Serving the “Segment of One” requires changes in the whole company and along the complete value chain, supported by a digital framework that provides the right capabilities to ensure a complete focus on the customer and deliver the level of detail necessary to meet their exacting requirements. In Research and Development, manufacturing companies need capabilities for individual product development to move from ETO (engineer-to-order) to CTO (configure-to-order) and MTO (make-to-order), extending the portfolio of products that can be individualized. This is supported by managing modular product concepts and integrating more digital capabilities, like software and sensors, into the physical products. Seamlessly collaborating with production to execute the manufacturing of a “lot size of one” is also essential. In Marketing, companies engage with the single customer in the right context and through all relevant channels. They precisely define target groups and run campaigns that directly address a customer’s individual requirements. In Sales, manufacturers take an approach of personalized selling, using the specific customer information and converting the individual needs into opportunities and orders. Product and solution configuration helps define the right offering, and this configuration is made available across all sales channels. In Production, the target is to produce the individual single product, a “lot size of one,” in the most cost-efficient way, enabled by a smart, integrated and flexible factory and by managing an adaptive and responsive supply chain for the provisioning of the required parts and components. And finally, in Aftermarket Service the segment of one is served by the manufacturer offering individual and customized services, starting with personalized support. Aftermarket service for the segment of one includes the ability to offer tailor-made and equipment-specific services and associated offerings. It thereby leverages equipment usage and condition data, acquired through IoT (Internet of Things), to build and optimize individualized service offerings. 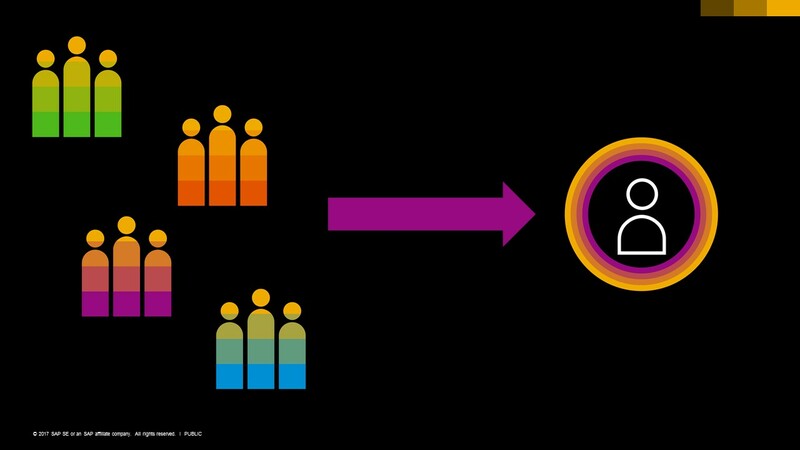 MAN Diesel and Turbo, mentioned above, is a great example of an innovative company that has implemented the “Segment of One” strategy along the complete value chain, and they did it using the digital business framework provided by SAP. With the right digital business framework, producers of industrial machinery can put more focus on the single customer and serve the “Segment of One,” differentiating themselves from the competition and profitably growing their revenue and market share. I look forward to your comments on this topic. What is your “Segment of One” strategy in your organization? Ulf Guttmann focuses on solution management and go-to-market for SAP’s Industrial Machinery and Components Business Unit. With over 26 years of SAP experience, Guttmann is well versed in the aftermarket service, enterprise asset management, and IoT solution areas.